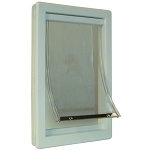 The Ideal Sash Window Pet Door For 33 to 38 Inch Windows is specially designed for sash windows. 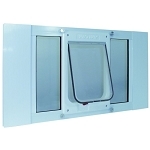 These Sash Pet Doors provides your pet with easy access in or out of your home without having to install the pet door within a door or wall. Very pleased with this unique doggy door. Easy to install. My little Schnauzer has no problems going in and out!!! She can even look outside without going out because of the Windows on each side!!! AWESOME PRODUCT!!! Love it !!!! I have a blue heeler and a collie mix (75lbs) they love the dog door and I do too. It sits in the middle of three large windows which take up a wall and it doesn't look weird. Most people don't even notice it until a dog goes in or out. I also have three small children who occasionally use the door door as well. I am a small woman and I easily installed it myself in under 30 minutes (including taking it out of the box). Great solution. Easy to install. Perfect alternative to door installation. I have a pair of French doors that open to my backyard. Found a doggie door for them but it was very costly and an eyesore. Fortunately I have a window that also opens to the backyard and is low enough that my dog can go out. This doggie window door works perfect. It's sturdy and easy to install. I'm very pleased with the product and would recommend to anyone. The window unit installed in just a few minutes and the dog assimilated in about 2 days. Very pleased with the product. Product is perfectly described and installed in minutes. I bought this to replace one that I have had for 10 years.. that one is a little worn, but, still works well....plan to give it to my daughter. I have cats and dogs that use it with a ramp to the patio. You can get replacement door flaps, which is great. I would recommend this to anyone who does not want a hole in their door or wall. Would like the sides of the sealing flap to have magnets to secure fit. The clear flap material could be a little heavier. Works very well for my two Boston terriers. We have an old house so it wasn't quite wide enough but we made it work! Door was exactly as described. It installed in seconds, and has been perfect! I received my pet aluminum sash window pet door very quickly! It was easy & fast to install. My dogs mastered the exit/entrance in a matter of days! Installed easily and securely. Well worth purchase price. Too small for most larger medium sized breeds. Great for Dachshunds, Yorkies and similar breeds. Love this door! I did not want to pay for a custom doggy door, which would also be an eye sore! This works perfectly and the dogs are happier having immediate access! Q: What is the height dimensions? The height from the top of the door to the bottom of the door (not the flap height) that sits in the sash window is 14". Q: How do I measure my window to make sure I get the right size? Open the window and measure where the frame is flush to the wall to the other side. That track is where the sash window sits. 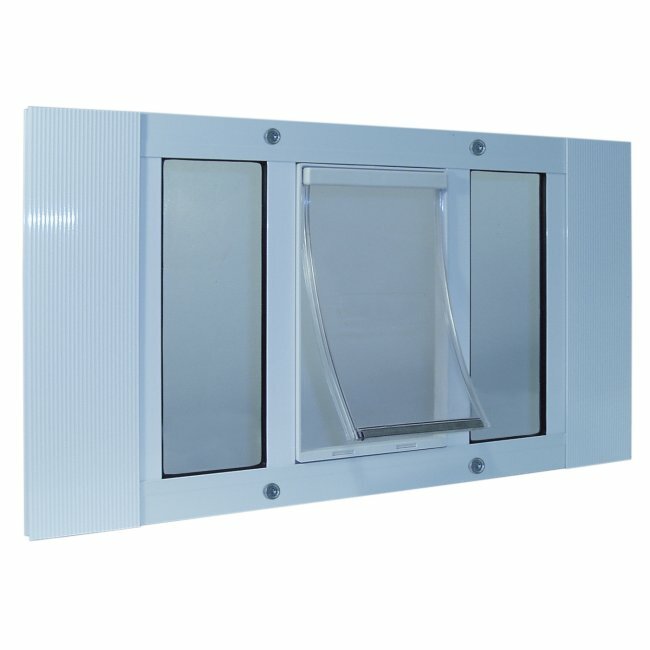 Q: Can the plastic window flap be secured to keep cats in at night? Yes, this door comes with a spring loaded locking slide that slides in & out so you can secure the door (see product description). Q: How large is the opening for the x-large dog? The flap opening for the XL door is 10-1/2" W x 15" H - For Pets 36 to 90 lbs (see product description for complete details). Q: Does the plastic flap close and seal once the cat passes though the opening so a/c is not lost through the flap and insects (flies, mosquito's, etc) can not get in the house? A: Yes the Lexan clear vinyl flap closes and is held in place by the magnetic closure system. Q: Does this door have something for the collar so only the dog gets out and not the cats? 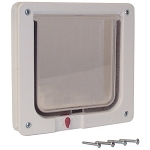 A: This pet door does not have anything on the collar to prevent pets from entering or leaving. You would need one of our electronic pet doors to have this feature. Please see https://www.radiofence.com/electronic-dog-doors for more information. Q: What are the dimensions of the flap on a medium dog door? Q: We have a window that is 22' tall X 36" wide. Could you make something to fit? Unfortunately, these doors cannot be made to order.